With European gas market stagnating, Russian giant Gazprom is upping stakes in the Indian market to spread its wings in the region. There are three key areas in which the 'gas dialogue' between Russia and India is active today: gas exploration and production, LNG supplies and gas transport projects. With its ambitious plans to expand into the Asia-Pacific region, Russian gas giant Gazprom sees India as an important and a promising partner. None of this comes as a surprise. The stagnation in the European gas market and booming Indian and Chinese economies are radically transforming the global energy market. Access to the Indian wholesale and retail markets will allow Gazprom to become a much more prominent player in the region before international energy giants such as Exxon, Chevron, BP and the Chinese state oil company CNPC get a toehold in it. Sergey Pravosudov, the General Director of the National Energy Institute, feels it would be more practical for Gazprom to produce gas in India. “Gazprom-Zarubezhneftegaz’ first offshore exploration experience in the Bay of Bengal, however, was not satisfactory. This does not mean that other projects would be unsuccessful,” said Pravosudov. Between 2006 and 2010, Gazprom drilled three offshore wells in the Bay of Bengal, but failed to find any commercially recoverable gas reserves. At the end of last year, it was reported that Oil India invited Gazprom to become an operating partner on two projects, one offshore and one onshore. Dmitry Kumanovsky, Head of Research at the LenMontazhStroi Investment Company, said that the focus is on the Krishna Godavari offshore field located in the country’s southeast and on another field in India’s north-eastern Mizoram state. The offer is being considered, but a final decision is yet to be made. There are currently 34 oil and gas blocks available for development in India, including eight deep-water, seven shallow water and 19 onshore sites. Besides Gazprom, Zarubezhneft, Rosneft, Stroytransgaz and other Russian companies are exploring opportunities. LNG is another sunshine area of bilateral cooperation. India is potentially a large LNG market that the Russian gas giant intends to start tapping as early as this summer. In December last year, Gazprom Marketing & Trading and Gujarat State Petroleum Corporation signed an agreement whereby the Russian holding company is planning to supply 300,000 tonnes of LNG to India in the next two years. In 2009, Gazprom and its Sakhalin-2 partners finished building the first Russian LNG plant on Sakhalin Island. The project made it possible to start supplying Russian LNG to the Asia-Pacific markets on a regular basis. Part of Gazprom’s strategy is to up its LNG production to 80-90m tonnes per annum, thus gaining a 25% share in the world LNG market. “India is a strategic market for us. GSPC is a key player in the Indian natural gas and LNG market,” said GM&T’s Executive Director Frédéric Barnaud. Russia’s involvement in the Trans-Afghanistan pipeline connecting Turkmenistan, Afghanistan, Pakistan and India (TAPI) has also opened up new possibilities. In December last year, India invited Gazprom to participate in the project; in one of the interviews that followed, President Dmitry Medvedev stated the company was ready to accept the offer. Gazprom can be involved at all stages of the project, from engineering and construction to production and sales to Afghanistan, Pakistan and India. The over 1,700km-long TAPI will originate near the largest fields in eastern Turkmenistan and cut across Afghanistan and Pakistan to end in the Indian town of Fazilka located on the border between India and Pakistan. The pipeline’s planned capacity is 33 billion cubic metres of gas per annum, 18 billion cubic metres of which would be purchased by India alone. The pipeline construction project costing $7.6 billion is due for completion in 2014. Dmitry Verkhoturov, expert at the Center for Modern Afghanistan Studies (CMAS), says that the new pipeline could be strategically utilised as a diversion route for Russian gas produced from Russian fields, e.g. Yamal, to the Asia-Pacific markets. “Gas supplies to India and Pakistan are likely to increase significantly and potentially reach a total of 100 billion cubic metres per annum. Turkmenistan would find it difficult to cater to such an increase in supplies on its own. This project could involve Uzbekistan, Kazakhstan and also Russia,” said Verkhoturov. The expert is convinced that while the potential journey Yamal gas would have to make in order to reach India would be significantly longer than the Europe-bound route (6,000 to 8,500km), the project is technically viable. The important thing is that the project can benefit from the existing gas transmission systems in Russia, Kazakhstan, Uzbekistan and Turkmenistan, and that it can be completed in five to six years. In other words, when the time comes to commission the TAPI-2 project featuring increased pipeline capacity of another 50-60 billion cubic metres, another gas pipeline system ready to transport Yamal gas to the Turkmen and the Afghan borders, could already be available. “Gazprom and Moscow were able to accept the fact that building TAPI and other similar alternative routes in the region was necessary and unavoidable, and have tried to benefit from these opportunities rather than oppose them. It is unclear who will win this game but the hope is that projects initially originating in the intention to weaken Russia’s position will eventually strengthen its energy independence,” said Nikita Mendkovitch, expert at the Center for Modern Afghanistan Studies (CMAS). 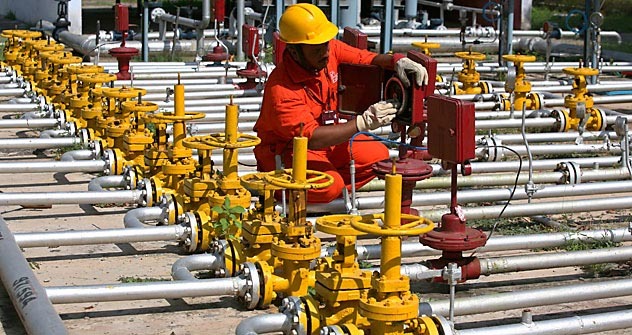 Furthermore, Gazprom is showing interest in being part of the Myanmar-Bangladesh-India gas pipeline construction project. According to Anna Lyukanova, expert at the ALOR Investment Company, new Russo-Indian fuel production projects in India may become a big step toward the long-intended strategic triangular alliance between Russia, India and China. The stagnating European gas market encourages the search for new markets that could accommodate Russian energy supplies.